The princess cut, as opposed to the round is square with sharp corners. This allows for a sleek modern look, as opposed to the more traditional round. 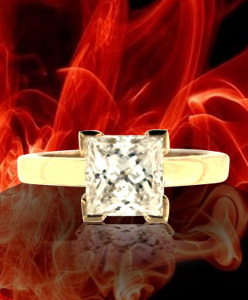 A lot cheaper – sometimes nearly half the price of an equivalent round diamond. 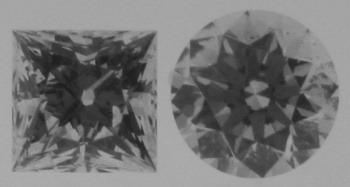 Unlike other fancy shapes, such as oval or marquise, light return is similar to rounds for AGS Ideal grades. Can be graded using the AGS cut grading system. To the naked eye, princess cuts generally look bigger than an equivalent round diamond. This entry was written by Nikhil Jogia and was posted on on Wednesday, August 20th, 2008 at 3:09 pm	and is filed under Buying Advice. You can follow any responses to this entry through the RSS 2.0 feed. You can leave a response, or trackback from your own site.